Veterans who were exposed to Agent Orange during service may be eligible for a variety of VA benefits, including a health exam, health care, and disability compensation for resulting diseases. However, even though the herbicide wounds and scars its victims by causing ailments and discomfort that last a lifetime, there is no official military decoration for those who've been exposed to it. A group of hardworking Vietnam Veterans and Agent Orange survivors in Hinesville, Georgia, wants to change that. Just as military members who are wounded or killed while serving receive a Purple Heart, the Agent Orange Medal committee would like to see all those affected by Agent Orange be awarded a commendation. The group has submitted their proposal to Congress in hopes the Legislative Branch will understand and recognize the serious sacrifices and hardships Agent Orange victims have had to contend with for decades. In the meantime, they're starting a registry to pay tribute to Agent Orange survivors from around the world. Individuals can list themselves or a loved one on the registry. A list of members will be posted on this website as they await official recognition in the form of an Agent Orange Medal from the United States Military. Anyone who is interested in making a donation is welcome to do so, and all proceeds generated by membership benefit the creation of the Veterans Memorial Walk in Hinesville. 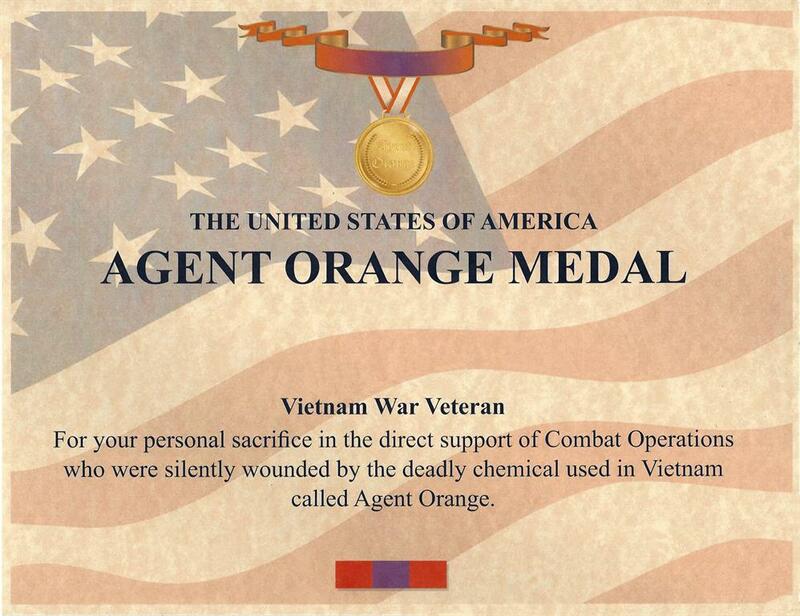 For an Agent Orange Medal registry application, please click here.